importance of your home computer. You run a business. You watch Netflix on a laptop at home. You save and store photos of your grandchildren. You blog, tweet and Instagram. You chat with friends overseas or around the corner. You connect with email. You play games. Your computer, laptop, tablet, phone and game console are an integral part of your life and a major part of day-to-day activities. Helping you take care of something so important requires the dedication, knowledge and commitment of a company that understands and cares. 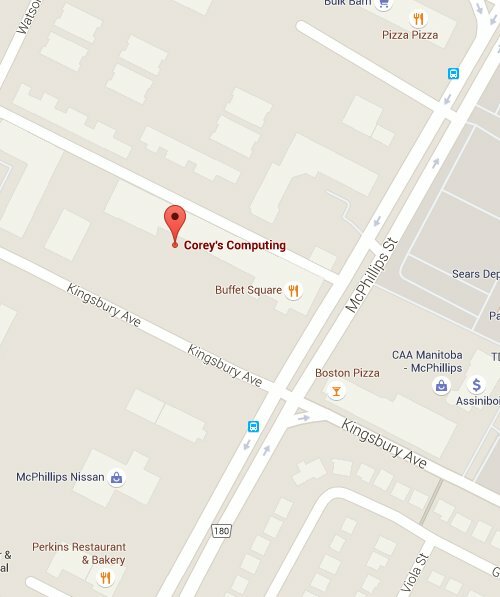 Corey’s Computing is family owned and operated and we offer friendly computer sales, service and repairs. We love computers and our mission is to make IT easy and simple to understand! We are dedicated to finding the right solutions for whatever computer issues you might have, or for any services you might require. When you bring something that needs to be repaired, from computers to consoles, Corey’s Computing dedicated team of experts will find the issue and fix it for you! For business we offer a variety of services to help you maintain your computers and network, on location or remotely, in addition to seeing to your need for any new equipment from computers to servers. We are your network service specialists. Corey’s Computing is always here to provide you advice and ensure you save money by keeping our prices competitive! We are committed to getting the right products and services for whatever computer application that you require.